It's perhaps telling that one of the most memorable moments from the trailer, and perhaps the film itself is a moment in which Arnold (Owen Wilson) and Isabella (Imogen Poots) sit together on a couch and sigh as they remark on just how confusing all of this is. "She's Funny That Way" is very complicated. Trying to explain this film would make it sound like too much, and it almost is. In fact, it very nearly comes off the rails, but the fact that while watching it, we can follow it and enjoy its comedy is telling of the strength of revered director Peter Bogdanovich. It's his first film in too long and it's somewhat reminiscent of (although not as good as) his underappreciated 1981 ensemble comedy "They All Laughed." 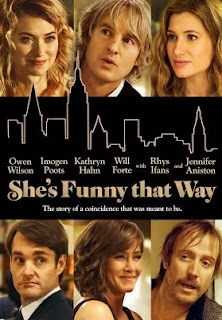 "She's Funny That Way" is a star studded ode to the madcap antics of the screwball genre. In fact it was previously titled "Squirrels to the Nuts" a reference to Ernst Lubitsch's 1946 romantic comedy "Cluny Brown," and a line that serves as Owen Wilson's character's pick up line throughout the film. While classic Hollywood would have bristled at the idea of some of the sexual themes in the film (or found a clever way to avoid bringing them up directly), the film does have the feeling of a classic comedy. In fact, it aspires, much like the classic comedies that inspired it, to be a work of fantasy, despite never including overtly whimsical moments. The one sentence story summary on IMDB reads like this, "on the set of a playwright's new project, a love triangle forms between his wife, her ex-lover, and the call girl-turned-actress cast in the production." And while that may be accurate as to what happens it inaccurately indicates that the playwright is the main character or anchor to the story. First of all, it's the director that's married and forms a love triangle, yet he does not anchor the story. The Playwright is another character entirely who happens to fall for the call girl, and of course there are certainly more love triangles as well. Nevertheless you get why I say this one is hard to explain and perhaps a little confusing. If anything the call girl-turned actress is the closest thing the film has to an anchor. The lack of a truly defined anchor is a strike against the film, as it contributes to a sense of muddled disorder. The call girl is Isabella Patterson (Imogen Poots). She begins the film by doing an interview with a Hollywood reporter to explain, in her almost distractingly over the top New Yorker accent, how she got to be where she is now. The rest of the film is essentially a flashback of her telling. Nevermind that she seems to know intimate details of other people's lives, including moments she was not around to witness. Yet that's where some of the flights of fancy come into play. The most notable of which is Broadway director Arnold Albertson's (Owens Wilson) good deeds done badly. He frequently uses the alter ego Derrick Thomas to get call girls to spend the evening with. Rather than simply spending the evening in his hotel room, he takes them out to dinner and on a romantic carriage ride. After making them feel special, he sleeps with them, gives them his trademark speech including the aforementioned phrase, "squirrels to the nuts" (I promise it makes sense in context), and hands over $30,000 if they agree to leave their immoral lifestyle behind in favor of following their dreams. It's a ridiculous thought that even the most successful of Broadway directors could afford to part with that much money as regularly as he does. Nevertheless the rather complicated series of love triangles starts with Isabella and Arnold/Derrick's evening together. As the plot description explained, Arnold happens to be married to actress Delta Simmons (Kathryn Hahn) who is unaware of her husband's infidelity. Yet she had an almost fling with her famous co-star on the play Seth Gilbert (Rhys Ifans) while working on a play years ago in London. Seth still has feelings for Delta, and having witnessed Isabella leaving Arnold's room spends the entirety of the film attempting to use it to regain his connection with Delta by turning her against Arnold. One of the numerous running gags is the comedy that ensues when Arnold tries to hide his past infidelities. He seems to continually run into the women whose lives he "changed." The most important is of course Isabella who happens to get an audition for the play. Her audition is great, and everyone likes her even though Arnold awkwardly tries to avoid casting her for obvious reasons. Despite his protests, Josh (Will Forte), the playwright immediately falls for her and pursues her despite being in a relationship with therapist Jane Claremont (Jennifer Aniston). The humorous irony here is that despite having several members of this ensemble as clients, Jane is actually the most neurotic of them all. Running her a close second is one such client, Judge Pendergast (Austin Pendleton) who spent an evening cheating on his wife with Isabella and now finds himself uncontrollably obsessed with her to the point of hiring a private detective to follow her. He's purely a comedic character, but then again so is Jane. Yet they remain some of the most humorous characters in the film. As a therapist Jane is supposedly sworn to secrecy, trusted with her client's deepest darkest secrets which she comically can't seem to shut up about. Her running gag is her unprofessional nature including her inability to keep a secret. Her boyfriend Josh, who she mistreats constantly and later falls for Isabella, is played mostly straight forward by Will Forte. The character feels lost in the shuffle, and like a missed opportunity for a talented comedic actor. The most impressive performances are that of the central love triangle square (or is it more? I lost count). Owen Wilson gives an understated performance, while Rhys Ifans and Kathryn Hahn both show off their aptitude for comedic timing. Imogen Poots' performance is good, particularly in her audition scene, yet her accent will be too over the top for some. These characters are nearly likable, yet they're purposely flawed in fairly negative ways. However, they are likely deserving of each other. The best moments in the film are the several scenes in which this large cast of love triangles converge on one location either by coincidence, accident, or for the sake of auditioning/rehearsing. Fittingly, each scene they rehearse in preparation for the play seems to match the circumstances at the given moment. Every character is given a running gag, and not all of them make sense (particularly Arnold's), yet the fact that they are a bit of a fantasy is partly the subject of the film. We aren't intended to know whether there is any truth to the tale Isabella tells to the reporter. The opening dialogue between the two indicates that we aren't supposed to take things too seriously. Isabella and the Hollywood reporter discuss how Lana Turner was discovered. Isabella's version of it embellishes the truth, but the reporter sees right through it. Isabella doesn't feel confined to the details of reality, instead preferring fantasies. If we had any doubt, a later scene assures us of it. A surprise cameo explains the origins of the "squirrels to the nuts" line, thus casting doubt on anything she's told us up to that point. "The master of French farce, Georges Feydeau, had a sort of a maxim: the one person that must not come into the room, must come into the room." "She's Funny That Way" most certainly lives up to this maxim. Just about every scene involves the one person that absolutely must not come into the room knocking on the door to come in. This did, for me, make for a funny film. It has its moments, and it certainly can be an enjoyable experience. It's just too much of some things and not enough of some other things. Fans of classic screwball comedies, and Peter Bogdanovich's filmography will want to check this one out (if they haven't already), but everyone else may want to steer clear.